Well, this is certainly something we did not expect to see, but perhaps it will set the tone for the highly anticipated BlackBerry 10 announcement. British electronics company Context announced that the PlayBook outsold the newest generation iPad by a fairly sizable margin during the last two months of 2012. Based on the sales channels that Context monitors (which does not include Apple’s own retail locations), the newest generation iPad saw 113,000 units move in November in December. 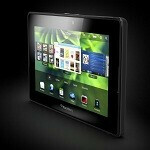 Over the same two month period, retailers sold 160,000 PlayBook tablets. Behind the iPad was the Nexus 7 (105,000), Samsung Galaxy Tab 10.1 (85,000) and Samsung Galaxy Tab 7-inch (60,000). Taken together, all generations of the iPad totaled 203,000 units during that time, but even then, the PlayBook’s sales performance is pretty impressive in the face of the popular iPad. One of the primary factors contributing to these sales is price. PlayBook prices start at £129 ($203) whereas the iPad starts much higher at £399 ($628). Trends are showing a movement toward a “price driven” market which does not favor Apple’s products. Research in Motion is also believed to be adding incentives which further bring price relief to the consumer and increase the margin to the retailer. If RIM is able to maintain that model for the near future, it may just provide enough fuel to find a willing user base to embrace the Canadian manufacturer’s handsets as well. BlackBerry most certainly has a loyal user base in Britain, and today’s announcement in New York may fan the flames for more ‘Berry sales – handsets and tablets alike. RIM certainly will not mind, and despite its dismal beginnings, the PlayBook is a very capable 7-inch tablet. Ive seen the playbook as low as 140$ nib state side. And 100$ refurbished. Yet why isnt it selling like hotcakes here? Cause price isnt always everything. People just dont want cheap things that want nice and reliable also. I didnt really hear bad things about the Playbook. Its nice IMO....I dont know about reliable. more awkward is that nexus 7 is outshine by PlayBook, which is not even market that much! they keep on saying nexus 7 is the best tablet for its price! I'm from the UK and I only know one person with a BB Playbook (my father) and that only cost him £129.99 for 64GB.